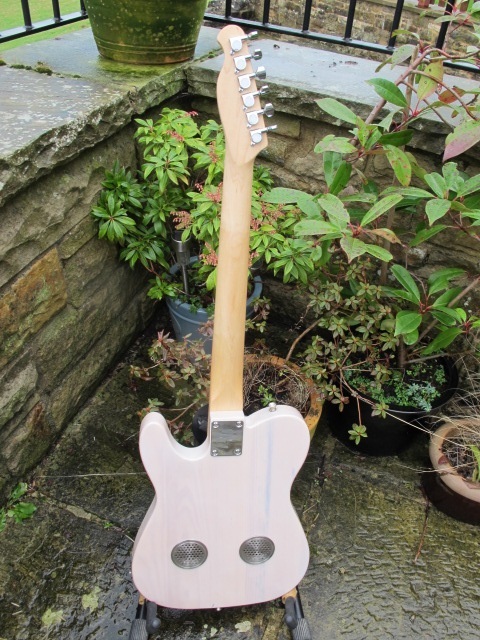 Cream Light Ash Body, Chunky-ish All maple Neck, Hotrail Humbucking Pickup, Slight Slide Biased Action, Red Torty Guard, Sieve Cover-plate, Front Mounted Controls, Rear Sound-ports. Lovely Acoustic and Electric Tones. A Cracker!!! 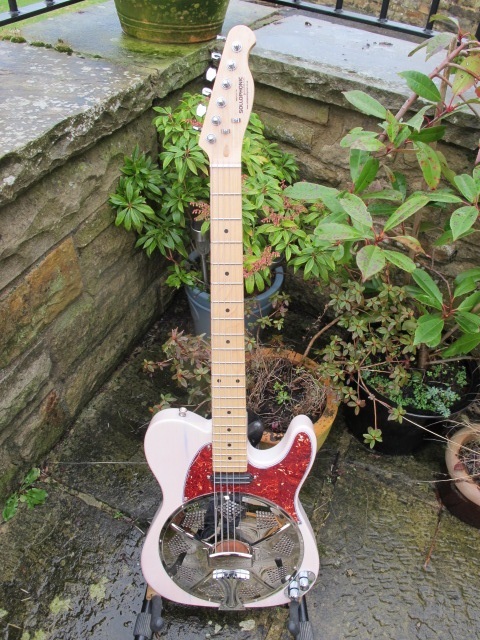 This is a cream ash bodied Sollophonic solid bodied resonator guitar, with a maple neck, Hot-rail pickup and red tortoiseshell pick-guard. 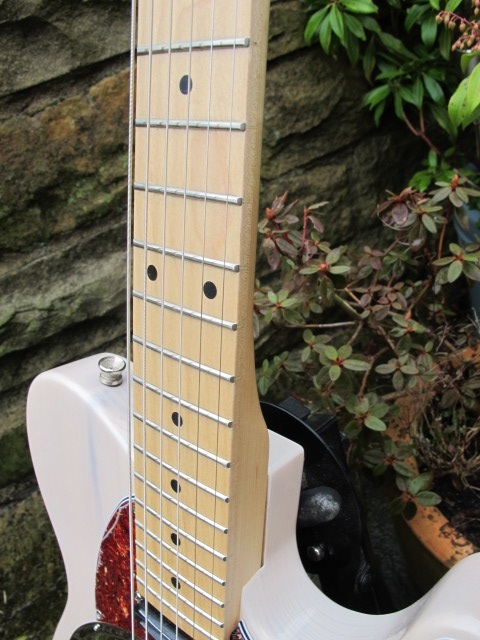 Like all Sollophonic guitars it has had a full fret dress and polish, has a Continental cone fitted and has a bone top nut with widened string spacing. A reasonably chunky maple neck with a satin finish is matched to a cream lacquered light ash body with a nice grain pattern. This one has a rosewood biscuit bridge and maple saddle, is strung with 12-52 strings and has an action set for a slight bias towards slide playing with 12th fret heights measured at 2.5mm bass side and 2mm treble side. This however allows for lower fret chord and finger-style playing, and of course can be further adjusted to suit your individual playing style. It has a Hot-rail humbucker pickup rated at 11K, mounted in a red tortoiseshell three ply scratch-plate and wired to front mounted controls on a chrome plate near the jack socket, topped with chrome knobs. This combination gives this lovely guitar a great, full bodied acoustic sound, coupled with a warm, rich hum-bucking electric tone from the Hot-rail pickup. Finally it has two rear sound-ports covered with stainless steel grilles, it has sieve-style cover-plate, and a standard length chrome tail-piece. 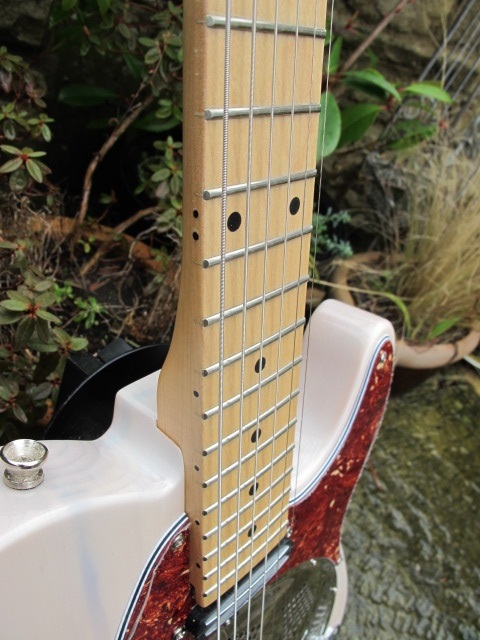 So to sum up;- a solid ash, cream lacquered body, slightly lighter weight than usual ash guitars, chunky maple neck, Hot-rail humbucking pickup, three ply red torty pick-guard, slight slide biased action, Continental cone, bone top nut, sieve style cover-plate, front mounted controls and rear sound-ports. 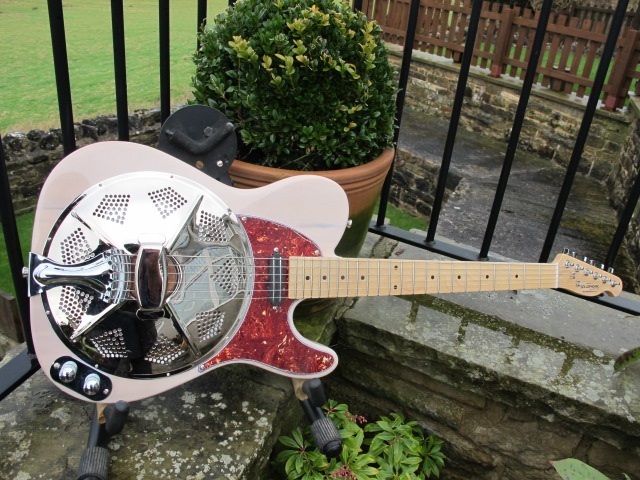 Sweet player and great sounding, with a classic cream, red torty, chrome/nickel combination.